How do you know when to call a professional sewer repair company? There are various factors to consider. Sewer repair projects do not always involve daunting tasks like replacing pipe, installing new sewer traps, sewer backwater valves, or locating hard to find sewer leaks or defects. Some sewer problems are easy to repair, and you don’t need a professional and licensed plumber to get the job done. But just as pictured above, even some seemingly easy projects are best left only to professionals. Trying to do a sewer repair yourself may lead to further damage, and more expensive difficulties. Hiring a professional allows for a quicker and more long-lasting sewer repair. Frequently a licensed plumber will provide a money-saving solution for the long run. You may save yourself from some trouble when you consider the following potential issues. Toilets that are backing up or slow flushing, and backups in the shower, are among the most common symptoms of main line issues. In most cases a skilled drain cleaner will clear the clog, avoiding a repair. However, when a sewer repair is required, it often requires specialty equipment that only professionals can operate. Renting professional tools and equipment is possible, but it will be useless if you don’t know how to operate them properly. It is not advisable to fix the main line, or do a sewer repair on your own. The skill and expertise required should not be underestimated. Whether you like it or not, replacing sewer pipe can cause damage to your property. For example floors, lawn, cement, asphalt, or even walls may need to be repaired afterwards. Knowing how to properly repair these finished surfaces is a skill-set unto itself. After a heavy rain, ground freezing during winter, the soil where sewer pipe resides can move and settle back again. Sewer pipes can moves up with frozen ground, but when the temperature is back to normal, a slight misalignment in sewer pipe or the connection can result. This can also affect the slope of the pipe. In other instances, where filled in ground is present, settlement can occur over a period of decades. This can cause pipe joints to become dislodged, or underground drain lines to crack. A misalignment can cause blockages, and the only way to repair this problem is to replace the pipe, or do a spot sewer repair. In almost all cases, excavation is required by skilled technicians. Your main sewer line is subject to cold weather for months during severe winter. Although extremely uncommon, a frozen sewer pipe is prone to damage and may need replacement immediately. Even though sanitary sewer lines carry heated water, and are typically below the frost line, frozen waste lines does occur. 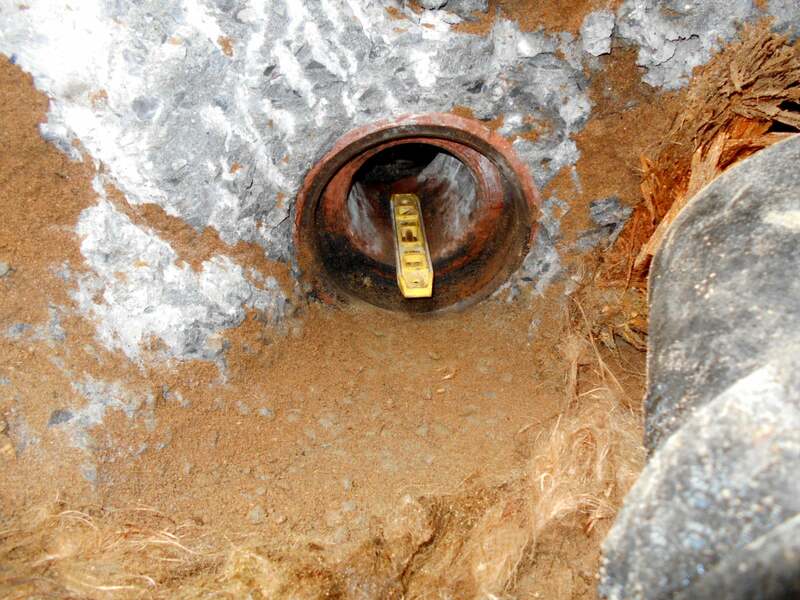 This can typically happen inside a sewer trap that is exposed to extreme weather conditions. A professional can locate the specific frozen spot. A professional can also replace only that specific spot instead of the entire pipe length, and insulate it from future damage. Repairing a drain line right the first time always saves money long term. Even some small projects are best left to professionals. During regular maintenance, for example, a professional will check for possible damage in the entire fresh water supply system, including the main sewer line, to make sure everything is running properly and you have enough water pressure for all appliances. Thorough regular maintenance also helps prevent an expensive repair in the future. Proper plumbing maintenance can include periodic drain cleaning, and exercising all water valves. Although all residential waste water drain systems run on the same principal, the principal of gravity, the pipes themselves can be different. There are some popular materials used for sewer pipes, and pipe material that is no longer legal. Some various sewer pipe materials are listed below. Extra heavy cast iron pipe is the material used for almost all house sewers in NYC. It provides trouble free service for many decades, if installed properly. The joints of each connection remain water tight for decades as well, preventing root infiltration. Perhaps its only drawback is that it is not imperious to acids or chemicals. So when the waste water is extremely acidic or alkaline, a neutralizing tank will be required to prevent damaging the cast iron pipe. Clay sewer pipe is technically referred to as vitrified clay pipe. It possesses both strength and durability, that far exceeds other pipe materials. Vitrified sewer pipes have been used for over four thousand years. There are still some ancient sewer systems constructed using clay pipes that continue to function. Clay is impervious to acids, acidic conditions, and chemicals. It’s one weakness is that its joints are prone to leak over time, allowing for root growth and pipe settlement. However, if installed with a concrete encasement, a clay drain system can last indefinitely. Typically when a sewer repair on clay is required, it is replaced with extra heavy cast iron pipes. This was more common in older home, and least durable with a lifespan of about 50 years. The main consideration to use this pipe is strength, but not durability. It was primarily used for branch drain lines, such as sink drains, and for venting. Therefore it is not commonly encountered. These materials, like galvanized pipe, are used infrequently in drain line systems. They are primarily used for water supply lines. Copper and brass pipe materials began to appear in the 1930s. They achieved popularity as the material of choice in houses built in the 1960’s, and became mandated by the plumbing code for water supply lines. Despite its thin walls and oxidation issues, copper pipes are known for its durability and heat resistance. The price for copper continuously increases, making it a costly material today. Copper and brass and sometimes used as drain lines for small or ornamental plumbing fixtures, but rarely as a main drain line. Also known as polyvinyl chloride, this whitish hard plastic pipe is rust and chemical resistant. It does not corrode or degrade over time. PVC is used mainly in a home sink, bathtub, and toilet drain lines. It is not suitable for hot water lines. It is increasingly the material of choice due to its low cost, and extreme ease of installation. In NYC it is not legal for use as a material for house sewer lines, or in commercial properties. Since the 1990s, PEX has become the standard material for residential sewer lines in many areas. It has all the characteristics of PVC, but it is heat resistant. Many colors are available, but most systems use red-colored PEX for hot water supply lines, and blue-colored PEX for cold water lines. Please note that PEX is not used for drain lines. Water pipe systems in a house are set up similar to a big tree, where the main sewer line is the trunk, while all the pipes that run to every faucet, sink, and shower are small branches. If the problem is in the main sewer line, all the branches will not function as they should. It the problem is in any of the branches, you have to isolate the culprit to do the proper repair. In the past, a professional sewer worker had to make the best guess by analyzing the symptoms of a problem to locate the culprit. The next step would be to do was dig the area, hoping they were right. Nowadays, modern equipment is available allowing for precise problem-locating. The best equipment to do the job is a sewer camera. Just like any modern camcorder, it records images along the sewer line, but it can feed every image to an external screen, and record the images as well. Sophisticated cameras can analyze many things, including but not limited to pipe diameter and corrosion. There are of course thousands of how-to instructional videos online, demonstrating how a sewer camera works and how to operate it. The biggest obstacle is actually the equipment. A professional quality sewer camera is waterproofed, and so is the cable that connects it to the external screen. You cannot use any typical camera such as a camcorder, or a smartphone to do this job. A professional-grade sewer camera with the wire, screen, and controlling console can cost about between $6,000.00 to $15,000, some models even more. It contains a powerful camera with great light sensitivity to work underground and it produces high resolution images. It has autofocus and self-correcting ability to stay upright. Once the culprit is located, a professional uses other specialty tools such as high-powered hydro jet and heavy duty snake auger, root cutting accessories, several types of water jet nozzles, and pipe replacement equipment.